It’s that time again… well, it ALMOST that time again. World Kidney Day is March 13, 2014 and many kidney organizations are gearing up for it. 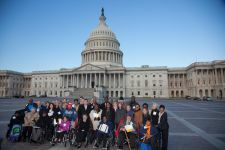 Dialysis Patient Citizens (DPC) is getting ready with their annual Fly-in when they bring 50-60 kidney patients from all over the US to Washington, DC to lobby Congress on behalf of kidney patients concerns. I encourage you to think of something, anything, you can do to raise kidney awareness on World Kidney Day. Many dialysis units will be having fund raising events of one form or another. For example, my unit is participating in a local Kidney Walk to raise money for the National Kidney Foundation. There are lots of events nationwide. You can support them by giving or participating or both. If you think of something, put it in the comments, please. Others can take from your ideas. Here are some ways you can participate on March 13 and during the month of March. This entry was posted in dialysis, Dialysis Center, Dialysis Patient Citizens, ESRD, kidney, lobbying, National Kidney Foundation. NKF, World Kidney Day and tagged dialysis, ESRD, fund raising, hemodialysis, kidney, lobbying, National Kidney Foundation, NKF. Bookmark the permalink. Thanks for the ‘advance warning!’ In February I plan to attend a one day conference, ably sponsored by NKF. I live 2 hours away from the conference but find the comraderie and general kidney centered info to be valuable. I am a PD patient and can usually find helpful info at these conferences. Maybe someday we’ll even have a support group in my town.